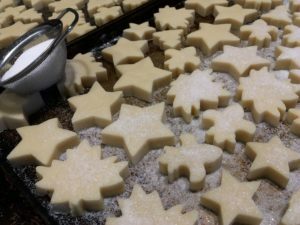 This simple shortbread recipe came from the Anderson side of my first wife’s family, good Scots all. My father’s family, the Ainslie’s are from Bo’Ness between Edinburgh and Glasgow on the Firth of Forth, due north of Linlithgow. So, I come by my love of this stuff honestly, which for a Scot, is important (though I have been told that the Ainslie name is more likely Viking than Scots; there was a lot of marauding going on back in the day). When it was taught to me, the butter was cubed and these ingredients were simply worked by hand until the warmth and action of the hands turned it into a cohesive dough. It can be patted out and scored for breaking after baking, or cut with cookie cutters. I work the dough into a 1” to 1.5” thick rectangle and wrap it in plastic wrap to rest. This rest allows the moisture from the butter (which is generally 20% water) to equalize and makes the dough easier to work. Tightly wrapped, you can leave this in the fridge overnight or for a day or two, but let it come to room temperature before you try rolling it out. I roll it to about 3/8” thickness, laying a favorite wooden spoon next to the dough as a guide, then cut the shortbread, place it on trays and chill them. I then dust them with sugar and bake them at 325° F. for about 25 minutes until the edges of some of them are just starting to show a little color. At this point remove them from the oven and let them finish and cool in the pan a bit before removing them to drying racks. They will still be fragile, but will toughen up as they cool. I prefer bite sized cookie cutters and favor maple leaf, stars of different sizes, a very small Christmas tree and this year, a fleur-de-lis which I bought down on Bayou Teche in Breaux Bridge, Louisiana this fall. Shortbread freezes well and can be kept that way for weeks, if not months. I simply make it up put it in airtight containers and leave it on an indoor, but unheated porch off the back of the house until I’m ready to ship it to friends and family.